Black and white for any day or night. 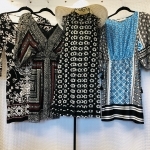 We have dresses for every occasion in every size and color. Check out Sweet Repeats today! We are open 10am-4pm Tuesday through Saturday. < Previous Stop and wear the flowers.